Let me ask you something.....Do you eat kale? Raise your hand if you eat kale. I can see a few hands going up - but the rest of you seem a bit sheepish. Well, it is time to start eating kale. Do not fear this leafy green - it is in your supermarket near the lettuce, it is cheap, and you can make it into something yummy. 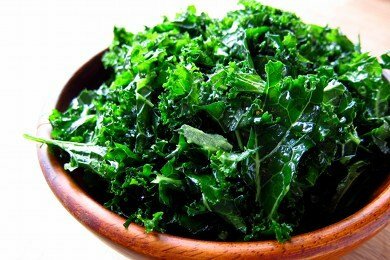 The first recipe to try with kale is to make kale chips. These are super easy and even my children will eat kale if made into "chips". I keep working with kale because I used to hate it and I am finding that I just didn't know how to cook or serve it. I have found a new trick that makes raw kale (that is right folks, RAW) super delicious. First, you turn your lights down real low. Then, you light a few candles, put on some Barry White, and MASSAGE your kale. I find that calling my kale "baby" helps the whole process. I know you think I am kidding, but I am serious. Drizzle some olive oil on chopped raw kale and massage it for two minutes. This massage results in softer kale - not unlike loosening the knots in a loved one's back. The kale will enjoy it and shrink in volume. I find that a little salt is all I need to make tasty kale and I don't even want lemon juice or vinegar. You cannot give up on kale! This is the vegetable that will solve all of your problems. Constipated? Eat kale. Want to avoid cancer? Eat kale. Overweight? Eat kale. Depressed? Eat kale. Looking for a boyfriend? well, I'm not sure about this one - but it might work! Wash kale and strip the leaves from the tough stem. Chop with a kitchen knife into small bits and make approximately 4 cups - add to large bowl. Add oil and salt. Massage kale for TWO minutes with olive oil or until it reduces in volume. Taste it and add lemon juice or vinegar as needed. Enjoy! What a great recipe! I'd never heard of massaging the kale before -- thanks for the tip. I think Kale is wonderful sauteed with olive oil and garlic. What a great post! I discovered kale last week. My new favorite veggie! Wow, just ate Kale for breakfast this morning and saw this. I like to saute in coconut oil, then add a cup of egg whites, cook until whites firm and then eat with salsa and hot sauce. May sound odd, but wonderful! Ha! You make me smile, Snack Girl! We adore kale in this house. We put it in smoothies (after your suggestion) I throw it into soup, and I also massage my kale (and I do indeed call it "Baby") with whatever dressing I use. "Eating Bird Food" had a really awesome kale salad recipe that is my current favorite. Yummy! We put kale in soups and stir-fries. Delicious! we love kale! Just had it last night sautéed with onion and mushrooms...my kids(8,7,3) love it raw in salads and in soups. Cant wait to try this recipe! I live in Florida, and in my flower beds, I planted kale, tomatoes and broccoli, lots of herbs, cauliflower, lettuce, green peppers and hot peppers all kinds as well as my mangoes and papaya and citrus, and guavas. Well Kale was just to say I planted it. Then I retired and worked in a bigger garden and now my grandson is going to come friday and dig a bigger garden. Kale will definitely be into it again. I put it in chicken soup and stir fry with it, made the kale chips, and tonight I am putting it into a salad made up of romaine, kale, tomatoes, cauliflower, carrots, celery, cukes, strawberries, grapes, parsley, and dill, with a light dressing. Looking so forward to it. I LOVE kale! Just had a kale, lettuce, strawberries, avocado and feta cheese salad for lunch. It gives it that extra crunch! Sauteed kale with garlic and onion is the best thing ever for me. I used to make a green shake with my kale, but just cooking it a little bit seems the best. I make kale like this all the time, but I add a cubed mango, and then I make a dressing by combining about 1/4 cup of honey w/ the same amount of lemon juice and a few grinds of black pepper. Then, while whisking, drizzle in enough olive oil to create a nice dressing. Toss the mango & kale w/ the dressing and top with toasted pepitas. This is a family favorite at our house, and we have it about once/week. My kids love it! Never had kale before but will soon! if you have a garden, try growing kale. it's so easy! it does well in cool weather and thanks to a mild winter in RI, i am still picking it in february! today i dusted the snow off the leaves and made a great hot pot of soup!